Mortise and Tenon woodworking is the basic timber framing method used to create these beautiful outdoor living spaces, called pergolas and arbors. A mortise (or mortice) and tenon joint is a type of joint that connects two pieces of wood or other material. Woodworkers around the world have used it for thousands of years to join pieces of wood, mainly when the adjoining pieces connect at an angle of 90°. In its basic form, it is both simple and strong. There are many variations of this type of joint, but the basic mortise and tenon comprises two components: the mortise hole and the tenon tongue. 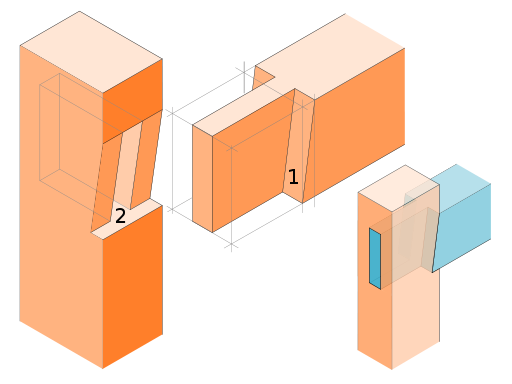 The tenon, formed on the end of a member generally referred to as a rail, fits into a square or rectangular hole cut into the corresponding member. The tenon is cut to fit the mortise hole exactly and usually has shoulders that seat when the joint fully enters the mortise hole. The joint may be glued, pinned, or wedged to lock it in place. Our pergolas and arbors are all hand crafted and prefabricated off site in a controlled and safe woodworkers shop with access to the variety of craftsmen tools that are used to ensure that the finished work completed with the highest quality. We produce digital designs for each element of a structure as well as to represent the final design. Sharing these designs with our customers in advance of any work being done allows us to effectively build and deliver exactly what a customer expects. King Street Vineyards uses a variety of Atlantic White, Northern White and Western Red Cedar, Douglas Fir, and other specialty milled woods. Depending on the wood, the degree of finish to the selected wood, size, and complexity of the design, our basic 72-80 square foot pergolas starts at around $3,000. This price reflects design, raw materials, hardware, prefabrication and site installation. It does not include site preparation. Quotes include scheduled date of completion. How we work with our Pergola and Arbor customers? We start by visiting your home and discussing the type of structure and its location on your property. We'll take pictures and measurements. With these, we'll create and send to you a group of digital designs to hone in on exactly the outdoor living structure you'd like us to build and install. Based on the design you select we'll provide you with a quote. We do require 50% deposit with the remainder paid upon completion and customer sign-off. KSV has added outdoor lighting sales and installation. Ask us about it.